We encourage eating plants — lots of them. Eat Plants, Plants, and More Plants: if you look at your plate or bowl, let vegetables make up about most of your plate from dark leafy greens to water-rich cucumbers for example. Try squeezing in greens or vegetables with breakfast, lunch, and dinner — need help? Check out hundreds of recipes loaded with veggies here. Eat Vibrantly: in the span of a day and the week, consume a wide variety of colors from fruits and vegetables. More colors = more antioxidants and a larger spectrum of nutrients. Eat Good Fat: not only will they help your body absorb fat-soluble nutrients, fat is vital to our health on a cellular level. Include nuts such as almonds or walnuts, seeds such as chia or hemp, coconut oil, avocado, salmon or other omega-3 rich foods, etc. at every meal. Avoid vegetable oils and of course trans/hydrogenated oils — learn more about fat here. Eat Animal Proteins Mindfully: since vegetables fill up your plate, use animal proteins as a “side” and always consume ethically raised and treated animals. Chat with your local farmer on how to find the best. Hydration Is Key: Try consuming 2-4 cups of water upon waking each morning for a couple weeks and see how you feel and how likely you are to drink more water throughout the day. Eating hydrating foods is one thing (i.e. cucumbers, peppers, watermelon, greens, etc. ), but drinking water, tea, etc. impact the way we think, feel, how our digestion moves along, our mood, etc. Learn why hydration is so important. Befriend The Oddballs: Fermented foods, seaweeds, seasonings or spices, or the green tops of carrots. Explore the wide variety of nutrients found in this not-so-common to the standard American diet, foods. For example, enjoy seaweeds on a weekly basis to ensure adequate iodine amongst numerous health benefits. New to seaweed? Try kelp flakes. Add Optimizer Options: you don’t have to use “superfoods”, but these nutrient-dense foods pack a punch for their small volume. Try maca, bee pollen, goji berries, cacao nibs, and medicinal mushrooms to fight inflammation, or check out your spice cabinet for cinnamon, ginger, garlic, and turmeric. Question Dairy and Gluten: Both of these are in the top 8 food allergy list so it’s no wonder why more and more people are finding they don’t tolerate these foods to some degree or have digestion issues. We don’t need dairy for calcium or other nutrients especially if you’re consuming a whole foods diet. If you do consume dairy, find a local farmer. Otherwise, explore the world of nut and seed plant milk- the possibilities are endless (and delicious!). Explore gluten-free grains such as quinoa, millet, amaranth, or starchy vegetables like sweet potatoes or other tubers. Pass On The Sugar: pass on the processed and refined sugars of any kind and be moderate with the use of natural sugars such as those found in fruit, maple syrup, honey, dates, etc. We live in a sugar-centric world where so many foods on the shelf contain added sugar where we may not even realize. Eat Fermented Food: supporting our digestive system through whole food fibers is incredibly important, but also consuming fermented foods such as kim chi, kefir, and fermented vegetables can really take our digestive health up a notch. Try adding a couple tablespoons with at least one meal a day if not all to get the good guys in. Balance It Out: balance each meal with plenty of fibrous vegetables (hey, greens! ), healthy fats, proteins, and carbohydrates like gluten-free grains, legumes, starchy vegetables, or fruit. Consume local and organic when possible. Eat real whole foods that you can trace back to the source. If you consume animal proteins in your diet; make sure they have been humanely raised and have been fed their natural diets. Be able to trace your food back to the source of where they were raised, fed, and how they existed. Connecting with your local farmer also supports your community, can be more affordable for you to eat healthfully, and it’s seasonal meaning you’re getting the best of the best foods at their peak nutrition. Besides honey (no expiration date), limit consuming anything with a longer expiration date than you, most of these shelf-stable food items often contain hydrogenated oils, and other preservatives that our bodies don’t need to thrive or for optimal health. 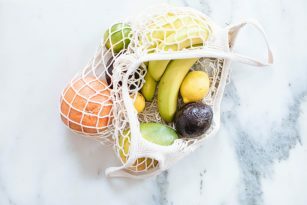 Granted there are great convenient whole food products in a bag or wrapper, just check the ingredients and make sure you understand what’s truly in that food. Better yet, challenge yourself to make more recipes, meals, and snacks from home anchored in whole foods. It’s okay to consume food out of sheer enjoyment and pleasure. Eating good food isn’t just about the nutrient density and nourishing our bodies on a physical level, it’s also about enjoyment and honoring the many ways food plays a role in our lives — social, mental, emotional, cultural, and physical. The next time you eat, try sitting down, taking a couple deep breaths to trigger our “rest and digest” nervous system and enjoy in gratitude, the food that’s on your plate. For more plant-based recipes, check out this page for hundreds of recipes!